We were excited to cross the Arizona border at 11:00 am on Friday. We still had five hours of driving to go before we’d reach Mesa, but we expected we’d at least get to Tucson before calling it a day. 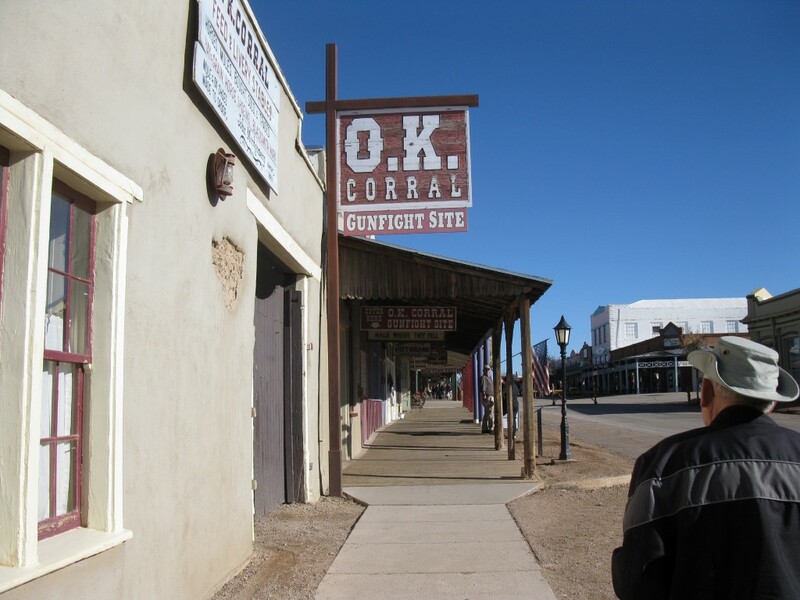 However, the billboards along the highway were calling us to Tombstone, so we had to heed the call. We took the exit off Hwy. 10 into Benson, and then took Hwy. 80, south to Tombstone, where we spent a few hours living in a time-warp, walking the plank sidewalks amongst cowboys, gunslingers and stage coaches. 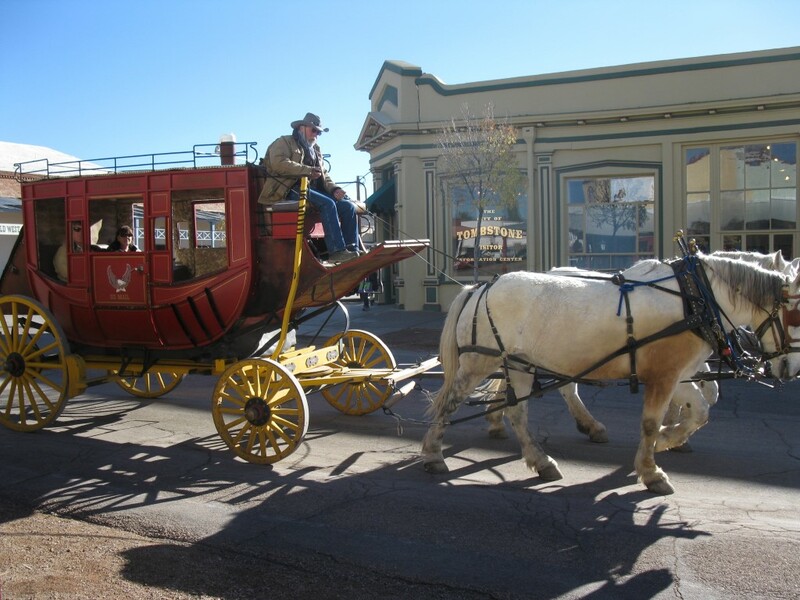 Stage Coach on Allan St.
We took in the re-enactment of the famous shootout at OK Corral involving Wyatt Earp, Doc Holiday and the Clanton and McLaury gangs. 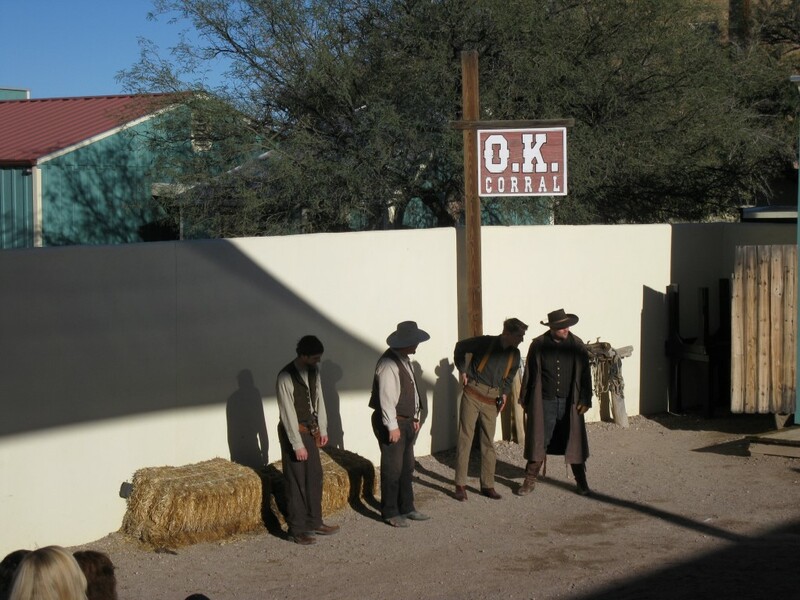 We sat through a film and histogram to learn about the development of Tombstone in 1880 during the silver mining rush, and its struggles to survive in one form or another over the next two centuries. The sun began to set and the temperatures began to drop when we climbed back into the motor home after everything closed up at 5:00 pm. Even though Benson was further north, the elevation was much lower, so we decided that a campsite back there might be more comfortable. At 6:00 pm we found a Wendy’s for a quick dinner, but went to the hardware store in the same mall first to pick up a couple of items. We were too late. What stores close up at 6:00 pm on a Friday night? Apparently in Benson it’s common practice. We looked up the RV Resorts in the area and drove to the closest and highest recommended one in the Good Sam Directory, but the office was already closed. On we went to another. The office there was closed too, but the owner saw us come in and told us where to park before he left us to return to the karaoke. With some difficulty and a little tension, because of the darkness and the need to back up to get into a spot, we got settled in for the night. We were exhausted and hit the sheet early. The furnace, although we thought we had the problem solved earlier, wasn’t working properly again. This meant having to get up during the night to manually turn it on and off by connecting the wires. 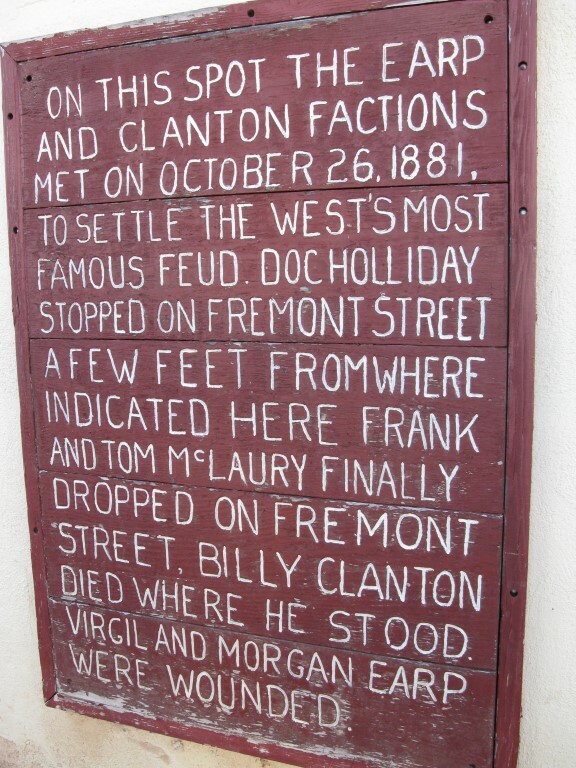 But we were glad that we’d made the trip to Tombstone, and if it hadn’t been for the cold weather we might have stayed another day. There was so much more that we hadn’t seen. By 12:30 pm on Saturday we were in Mesa. Before going to the RV Resort we hoped to get the motor home and the bike washed. We had seen many signs along the highway advertising RV washes, but in Mesa we could find none. Instead, Jim backed the bike into a car wash so we could get the grease and grime off of it at least to make it ride-able. We managed to get most of the dirt off the back of the RV too. At 5:15 we pulled into Mesa Regal RV Resort and got our spot. Set up and dinner was all that we managed before bedtime. Sunday was devoted to “nesting”: finding our way around town to purchase some necessities like a phone SIM card and a new thermostat for the furnace; catching up on a week’s worth of laundry. On the way to the Laundromat, just a couple hundred feet from “home”, we noticed the parking lot of the main building was rapidly filling up with cars. We asked what was going on and were told that there was a choir performing in the Regal Ballroom. We deposited our laundry into the washers and then went to see just what all the fuss was about. On the stage was a ninety member choir, accompanied by a twenty-five piece orchestra. We were thoroughly entertained with beautiful Christmas music, mostly unique arrangements of the traditional Christmas Carols. The hall was packed. It looks like it’s going to be a beautiful Christmas here, despite not being white. 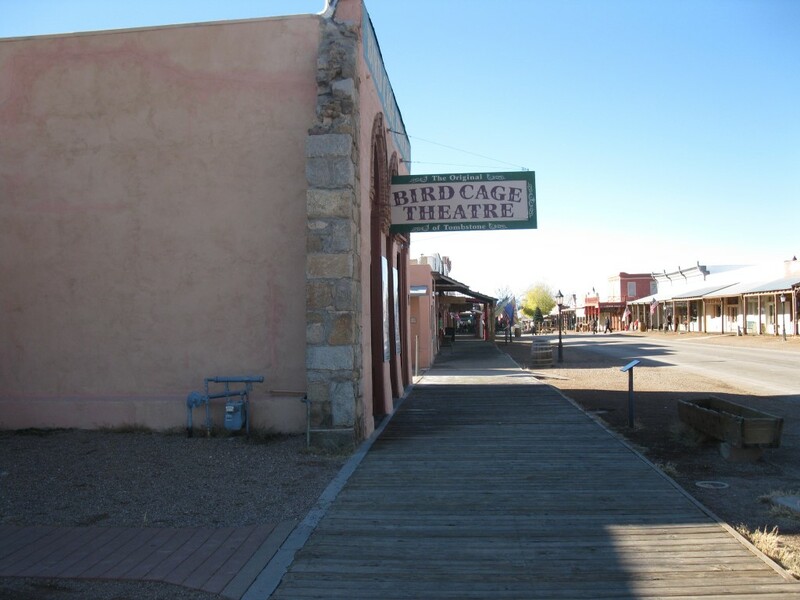 This entry was posted in Museums, Photography, RV Travel, Travel and tagged Arizona, Doc Holiday, Gunfight, museum, OK Corral, Tombstone, Wyatt Earp. Bookmark the permalink. So glad you got into Tombstone!! and glad that you have arrived at your destination!! Bloody cold here!! Enjoy each day together!! Enjoying your travel all the way. You are so adventurous and flexible. I have a friend in Oakville who owns a park model in Mesa. Marie Winter has been going to Towerpoint Resort for years. She is a very tall, striking 80+ woman. Moreover friends from Kingston have a trailer now parked in Apache Junction. Beautiful part of USA.